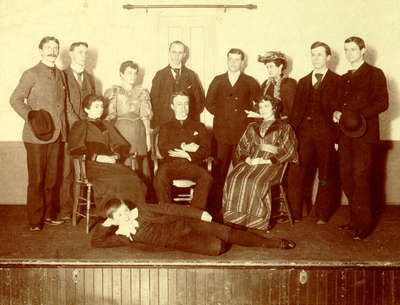 A play under the direction of Miss Anna Law was given as a fundraiser for the library. Standing in the back row: (left to right) George W. Springer, Edward Billingslea, Mrs. John Spear (nee Gertrude Drury), Court Taylor, Paul Panushka, Miss Anna Law, John Spear, John Panushka. Seated (left to right) Mrs. J. Melville Brown (nee Lillian Crocker), Albert Billingslea and Mrs. Charles Dingee (nee Leanora Panushka). Lying on the floor is John Ling. H. M. Dibble, Co., Box 845, Chicago, Illinois. No.450, Series C.